Call us on 0845 0134003 for technical support or use and see our online Dyson advice site for information on how to repair your vacuum. 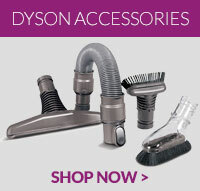 This Dyson post filter cover is iron in colour and fits Dyson DC08, DC08 Telescope, DC19, DC19T2, DC.. This seal is a genuine spare part for select models of Dyson vacuum cleaners .. This item is a genuine part for select Dyson vacuum cleaners ..
A genuine Dyson part, this bumper strip is designed to replace snapped, cracked or otherwise damaged..